This native leafminer has long been found in the eastern United States and Canada, northern South America, and the Caribbean. However, in recent years it has been introduced into California, Europe, and elsewhere. Expanded traffic in flower crops appears to be the basis for the expanding range of this species. Liriomyza trifolii (Burgess), sometimes known as the American serpentine leafminer, readily infests greenhouses. As a vegetable pest, however, its occurrence is limited principally to tropical and subtropical regions. It is a very common problem in Florida. 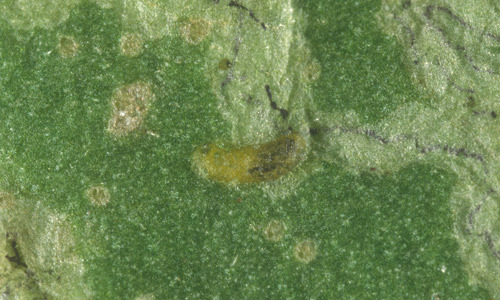 Liriomyza trifolii is considered to be one of the three most-damaging polyphagous leafminers of horticultural crops. All originated in the New World but all have been spread widely. The other two important species are Liriomyza sativae Blanchard (vegetable leafminer) and Liriomyza huidobrensis (Blanchard) (pea leafminer). Leafminers have a relatively short life cycle. The time required for a complete life cycle in warm environments such as Florida is often 21 to 28 days, so numerous generations can occur annually in warm climates. Leibee (1984) determined growth at a constant 25°C, and reported that about 19 days were required from egg deposition to emergence of the adult. Development rates increase with temperature up to about 30°C; temperatures above 30°C are usually unfavorable and larvae experience high mortality. Minkenberg (1988) indicated that at 25°C the egg stage required 2.7 days for development; the three active larval instars required 1.4, 1.4, and 1.8 days, respectively; and the time spent in the puparium was 9.3 days. Also, there was an adult preovipostion period that averaged 1.3 days. The temperature threshold for development of the various stages is 6 to 10°C except that egg laying requires about 12°C. Egg: Eggs tend to be deposited in the middle of the plant; the adult seems to avoid immature leaves. The female deposits the eggs on the lower surface of the leaf, but they are inserted just below the epidermis. Eggs are oval in shape and small in size, measuring about 1.0 mm long and 0.2 mm wide. Initially they are clear but soon become creamy white in color. Larva: The larva is legless. 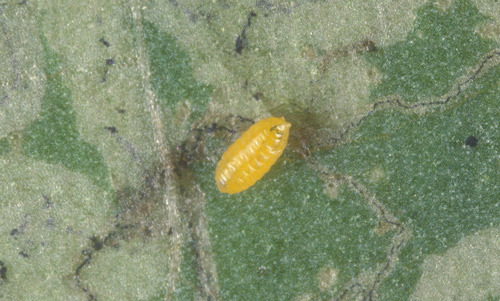 Initially the larva is colorless, but becomes yellowish as it matures. Unlike in many flies, the larva of this insect does not taper strongly toward the head end. It also bears a pair of spiracles at the posterior end. The lengths of the body and mouthparts (cephalopharyngeal skeleton) can be used to differentiate instars; the latter is particularly useful. For the first instar the mean and range of body and mouthpart lengths are 0.39 (0.33 to 0.53) mm and 0.10 (0.08 to 0.11) mm, respectively. For the second instar the body and mouth parts measurements are 1.00 (0.55 to 1.21) mm and 0.17 (0.15 to 0.18) mm, respectively. For the third instar the body and mouth parts measurements are 1.99 (1.26 to 2.62) mm and 0.25 (0.22 to 0.31) mm, respectively. A fourth instar occurs between puparium formation and pupation, but this is a nonfeeding stage and is usually ignored by authors. Puparium: The larva normally leaves the leaf mine and drops to the soil to pupate (or more technically, pupariate). The puparium is initially yellowish, then golden brown, but turns darker brown with time. This is oval and slightly flattened ventrally. It measures about 1.3 to 2.3 mm long and 0.5 to 0.75 mm wide. The puparium has posterior spiracles on a pronounced conical projection, each with three distinct bulbs, two of which are elongate. Figure 1. Larva of the American serpentine leafminer, Liriomyza trifolii (Burgess), in a leaf mine. Photograph by Lyle J. Buss, University of Florida. Figure 2. Larva of the American serpentine leafminer, Liriomyza trifolii (Burgess), exposed from a leaf mine. Photograph by Lyle J. Buss, University of Florida. Figure 3. Puparium of the American serpentine leafminer, Liriomyza trifolii (Burgess). Photograph by Lyle J. Buss, University of Florida. Adult: Adults are small, measuring less than 2 mm in length, with a wing length of 1.25 to 1.9 mm. The head is yellow with red eyes. The thorax and abdomen are mostly gray and black although the ventral surface and legs are yellow. The wings are transparent. 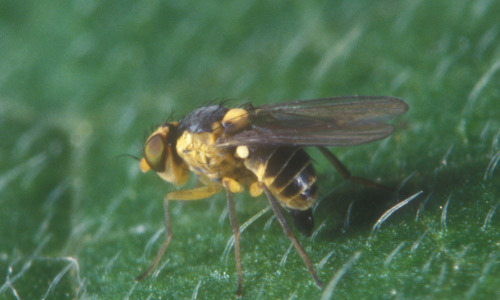 Key characters that serve to differentiate this species from the vegetable leafminer, Liriomyza sativae Blanchard, are the matte, grayish black mesonotum and the (mostly to entirely) yellow hind margins of the eyes. In vegetable leafminer the mesonotum is shining black and the hind margin of the eyes is darker. The small size of this species serves to distinguish it from pea leafminer, Liriomyza huidobrensis (Blanchard), which has a wing length of 1.7 to 2.25 mm. Also, the yellow femora of American serpentine leafminer help to separate it from pea leafminer, which has darker femora. Figure 4. Adult American serpentine leafminer, Liriomyza trifolii (Burgess). Photograph by Lyle J. Buss, University of Florida. Figure 5. Adult American serpentine leafminer, Liriomyza trifolii (Burgess). Photograph by Lyle J. Buss, University of Florida. Adults live about 13 to 18 days. Leibee (1984), working with celery as a host plant, estimated that oviposition occurred at a rate of 35 to 39 eggs per day, for a total fecundity of 200 to 400 eggs. Parrella et al. (1983) reported similar egg production rates on tomato, but lower total fecundity, because tomato is a less suitable larval host. The female makes numerous punctures of the leaf mesophyll with her ovipositor, and uses these punctures for feeding and egg laying. The proportion of punctures receiving an egg is about 25% in chrysanthemum and celery, both favored hosts, but only about 10% in tomato, which is less suitable for larval survival and adult longevity. Although the female apparently feeds on the exuding sap at all wounds, she spends less time feeding on unfavorable hosts. The males live only two to three days, possibly because they cannot puncture foliage and therefore feed less than females, whereas females usually survive for about a week. Typically they feed and oviposit during much of the daylight hours, but especially near mid-day. A good summary of American serpentine leafminer biology was published by Minkenberg and van Lenteren (1986). Keys for the identification of agromyzid leafminers can be found in Spencer and Steyskal (1986). Liriomyza trifolii is perhaps best known as a pest of chrysanthemums and celery, but it has a wide host range. For example, Stegmaier (1966) reported 55 hosts from Florida, including bean, beet, carrot, celery, cucumber, eggplant, lettuce, melon, onion, pea, pepper, potato, squash, and tomato. Flower crops that are readily infested and which are known to facilitate spread of this pest include chrysanthemum, gerbera, gypsophila, and marigold, but there are likely many other hosts, especially among the Compositae. Numerous broad-leaved weed species support larval growth. Schuster et al. (1991) found that the nightshade Solanum americanum; Spanish needles, Bidens alba; and pilewort, Erechtites hieracifolia; were suitable weed hosts in Florida. Punctures caused by females during the feeding and oviposition processes can result in a stippled appearance on foliage, especially at the leaf tip and along the leaf margins (Parrella et al. 1985). However, the major form of damage is the mining of leaves by larvae, which results in destruction of leaf mesophyll. The mine becomes noticeable about three to four days after oviposition and becomes larger in size as the larva matures. The pattern of mining is irregular; although tending to be blotch-like near the end of the mine. The shape is influenced by the plant, so is not a reliable indicator of species. Near the end of the mine the frass becomes more granular, which is not the case with Liriomyza sativae. Both leaf mining and stippling can greatly depress the level of photosynthesis in the plant. Extensive mining also causes premature leaf drop, which can result in lack of shading and sun scalding of fruit. Wounding of the foliage also allows entry of bacterial and fungal diseases. Figure 6. 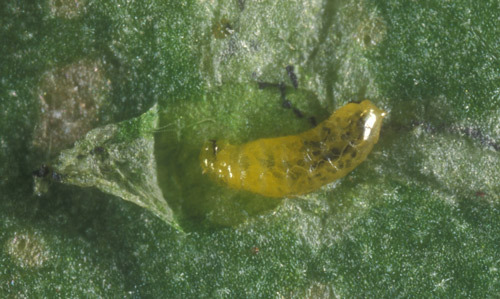 Mine in tomato leaf caused by Liriomyza leafminer. Photograph by J. Castner, University of Florida. Although leaf mining can reduce plant growth, crops such as tomato are quite resilient, and capable of withstanding considerable leaf damage. It is often necessary to have an average of one to three mines per tomato leaf before yield reductions occur (Levins et al. 1975, Schuster et al. 1976). In potatoes, Wolfenbarger (1954) reported sizable yield increases with as little as 25% reduction in leafminer numbers, but leafminers were considered to be less damaging than green peach aphid, Myzus persicae (Sulzer). Leafminers are most damaging when they affect floricultural crops due to the low tolerance of such crops for any insect damage. Parasitic wasps (parasitoids) of the families Braconidae, Eulophidae, and Pteromalidae are important in natural control, and in the absence of insecticides usually keep this insect at low levels of abundance. At least 14 parasitoid species are known from Florida alone. Species of Eulophidae such as Diglyphus begina (Ashmead), Diglyphus intermedius (Girault), Diglyphus pulchripes, and Chrysocharis parksi Crawford are generally found to be most important in studies conducted in North America, although their relative importance varies geographically and temporally (Minkenberg and van Lenteren 1986). Predators and diseases are not considered to be important, relative to parasitoids. However, both larvae and adults are susceptible to predation by a wide variety of general predators, particularly ants. Sampling. There are many methods of assessing leafminer abundance. Counting mines in leaves is a good index of past activity, but many mines may be vacant. Counting live larvae in mines is time consuming, but more indicative of future damage. Puparia can be collected by placing trays beneath foliage to capture larvae as they evacuate mines, and the captures are highly correlated with the number of active miners. Adults can be captured by using adhesive applied to yellow cards or stakes. Sequential sampling plans for determining the need for treatment, based on the number of mined leaves, were developed by Wolfenbarger and Wolfenbarger (1966). 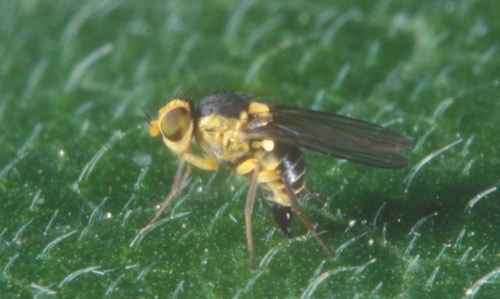 Similar plans based on counts of puparia and flies were developed by Zehnder and Trumble (1985). Insecticides. Chemical insecticides are commonly used to protect foliage from injury, but insecticide resistance is a major problem. Insecticide susceptibility varies widely among populations, and level of susceptibility is directly related to frequency of insecticide application. In Florida, longevity of insecticide effectiveness is often only two to four years, and then is usually followed by severe resistance among the treated populations. Rotation among classes of insecticides is recommended to delay development of resistance. Reduction in dose level and frequency of insecticide application, as well as preservation of susceptible populations through nontreatment of some areas, are suggested as means to preserve insecticide susceptibility among leafminer populations (Mason et al. 1989). Insect growth regulators have been more stable, but are not immune from the resistance problem. Insecticides also are highly disruptive to naturally occurring biological control agents, particularly parasitoids (Murphy and LaSalle 1999). Use of many chemical insecticides exacerbates leafminer problems by killing parasitoids of leafminers. This usually results when insecticides are applied for lepidopterous insects, and use of more selective pest control materials such as Bacillus thuringiensis is recommended as it allows survival of the leafminer parasitoids. Biological control. Because parasitoids often provide effective suppression of leafminers in the field when disruptive insecticides are not used, there has been interest in release of parasitoids into crops. This occurs principally in greenhouse-grown crops, but is also applicable to field conditions. Parrella et al. (1989) published information on mass rearing Diglyphus begini for inoculative release. Steinernema nematodes have also been evaluated for suppression of leaf mining activity. One of the most complete studies, by Hara et al. (1993), showed that high levels of relative humidity (at least 92%) were needed to attain even moderately high (greater than 65%) levels of parasitism. Adjuvants that enhance nematode survival increase levels of leafminer mortality (Broadbent and Olthof 1995), but thus far nematodes are not considered to be a practical solution to leafminer infestations. Cultural practices. Because broadleaf weeds and senescent crops may serve as sources of inoculum, destruction of weeds and deep plowing of crop residues are recommended. Adults experience difficulty in emerging if they are buried deeply in soil. Cultural practices such as mulching and staking of vegetables may influence both leafminers and their natural enemies. 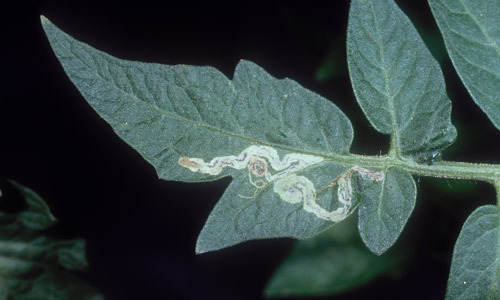 Price and Poe (1976) reported that leafminer numbers were higher when tomatoes were grown with plastic mulch or tied to stakes. At least part of the reason seems to be due to lower parasitoid activity in plots where tomatoes were staked. Broadbent AB, Olthof THA. 1995. Foliar application of Steinernema carpocapsae (Rhabditida: Steinernematidae) to control Liriomyza trifolii (Diptera: Agromyzidae) larvae in chrysanthemums. Environmental Entomology 24: 431-435. Hara AH, Kaya HK, Gaugler R, Lebeck LM, Mello CL. 1993. Entomopathogenic nematodes for biological control of the leafminer, Liriomyza trifolii (Dipt. : Agromyzidae). Entomophaga 38: 359-369. Levins RA, Poe SL, Littell RC, Jones JP. 1975. Effectiveness of a leafminer control program for Florida tomato production. Journal of Economic Entomology 68: 772-774. Mason GA, Tabashnik BE, Johnson MW. 1989. Effects of biological and operational factors on evolution of insecticide resistance in Liriomyza (Diptera: Agromyzidae). Journal of Economic Entomology 82: 369-373. Minkenberg OPJM. 1988. Life history of the agromyzid fly Liriomyza trifolii on tomato at different temperatures. Entomologica Experimentalis et Appliciata 48: 73-84. Minkenberg OPJM, van Lenteren JC. 1986. The leafminers Liriomyza bryoniae and L. trifolii (Diptera: Agromyzidae), their parasites and host plants: a review. Wageningen Agric. Univ. Papers 86-2. 50 pp. Murphy ST, LaSalle J. 1999. Balancing biological control strategies in the IPM of New World invasive Liriomyza leafminers in field vegetable crops. Biocontrol News and Information 20: 91N–104N. Parrella MP, Robb KL, Bethke J. 1983. Influence of selected host plants on the biology of Liriomyza trifolii (Diptera: Agromyzidae). Annals of the Entomological Society of America 76: 112-115. Parrella MP, Jones VP, Youngman RR, Lebeck LM. 1985. Effect of leaf mining and leaf stippling of Liriomyza spp. on photosynthetic rates of chrysanthemum. Annals of the Entomological Society of America 78: 90-93. Parrella MP, Yost JT, Heinz KM, Ferrentino GW. 1989. Mass rearing of Diglyphus begini (Hymenoptera: Eulophidae) for biological control of Liriomyza trifolii (Diptera: Agromyzidae). Journal of Economic Entomology 82: 420-425. Price JF, Poe SL. 1976. Response of Liriomyza (Diptera: Agromyzidae) and its parasites to stake and mulch culture of tomatoes. Florida Entomologist 59: 85-87. Schuster DJ, Jones JP, Everett PH. 1976. Effect of leafminer control on tomato yield. Proceedings of the Florida State Horticultural Society 89: 154-156. Stegmaier CE. 1966. Host plants and parasites of Liriomyza trifolii in Florida (Diptera: Agromyzidae). Florida Entomologist 49: 75-80. Wolfenbarger DO. 1954. Potato yields associated with control of aphids and the serpentine leaf miner. Florida Entomologist 37: 7-12. Wolfenbarger DA, Wolfenbarger DO. 1966. Tomato yields and leaf miner infestations and a sequential sampling plan for determining need for control treatments. Journal of Economic Entomology 59: 279-283.